A vice-presidential pick is always important, but John McCain confronts a starkly existential choice this year. Is he running as a Republican or chiefly as a bipartisan deal-maker? Does he have a reasonable shot at victory, or face desperately long odds? Does he want a traditional administration -- with the option of running for re-election -- or something completely different? The answers will go a long way to determining whether McCain picks Connecticut Sen. Joe Lieberman as his running mate. McCain has left the door open to picking a pro-choice veep candidate, and the pro-choice former Homeland Security Secretary and Pennsylvania Gov. Tom Ridge and Lieberman are reportedly on his short list. Selecting Ridge, who is at least a Republican, would be a more cautious choice, but also a foolish one. Whatever help he might give in Pennsylvania would be overwhelmed by the disappointment of the evangelical voters who have of late been rallying around McCain. Although Lieberman is more heterodox than Ridge, he makes more sense -- if McCain is willing to follow through on the radical logic of his selection. Despite being an independent, Lieberman still caucuses with the Democrats in the Senate and has a standard liberal voting record. In 2007, Lieberman and his fellow Connecticut Sen. Chris Dodd -- sometimes talked about as a vice-presidential possibility for Barack Obama -- had identical 70 percent ratings from the liberal Americans for Democratic Action. Ordinarily, his selection would mean GOP civil war. Never in recent memory has a national ticket had a candidate so at odds with the ticket's party. In 1840, the Whigs put an estranged Democrat, John Tyler, on the ticket with William Harrison -- a clever expedient they regretted when Harrison died and Tyler governed as an unreconstructed Democrat the rest of his term. To placate Republicans and maximize the political impact of his selection, Lieberman would have to join the ticket as part of a McCain pledge to serve just one term. 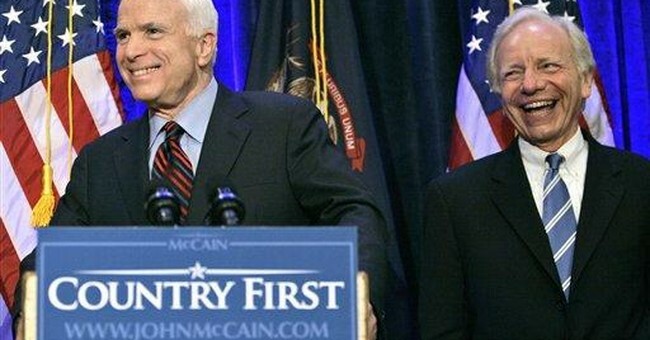 Both McCain and Lieberman would promise not to run for president in 2012, removing any possibility of Lieberman becoming a successor or putting his imprint on the Republican Party. Their administration would be above electoral politics, a high-minded exercise in competent governance and bipartisan compromise. To assuage Republican fears of a Harrison/Tyler scenario, Lieberman would have to pledge, if he were to ascend to the presidency, to appoint constitutionalist judges and honor McCain's domestic priorities. Lieberman is the natural complement for a one-term pledge. He is a politician with no aspirations in the GOP, with little future in his own caucus, and with a long record of bipartisan cooperation. If McCain decides the only possible path to victory is a risk-taking, unconventional one, Lieberman is his man. The ticket would be the American equivalent of Israel's centrist Kadima party. It would represent the Republican Party's acquiescence to its exile in 2008, although perhaps for only four years and not as far into the outer darkness as if Obama wins. The executive branch would at least be led by two hawks on the war who would check the worst excesses of the Reid-Pelosi Congress. If they were elected. And there's no guarantee of that. A McCain-Lieberman ticket might have an unbecoming pleading quality -- please, we're not really Republicans, so let us in for just 1,461 days. The ticket would make McCain, the experienced hand, the steward of a campaign verging on the gimmicky. Finally, how could Lieberman follow McCain's domestic priorities when McCain himself doesn't always seem to know what those are? McCain-Lieberman is a more desperate move than McCain should feel compelled to make right now. But check back after Denver.